Logan Sabins tracks his shot at the Butler Fall Invitational. Sabins joined Butler’s team after transferring from Brookdale Community College. Photo by Chris Brown. Before Logan Sabins started golfing for Butler, before placing in the top 10 at the 2017 New Jersey State Open, and before he won the Invitational at Savannah-Harbor in February, Sabins was sending emails. Lots of them. There are close to 300 Division I men’s golf teams in the country. Between high school and a two-year stint at a community college, Sabins had emailed nearly every single Division I golf program. The first set of emails he sent as a senior in high school. The lack of interest was not about to stop him. Sabins had played football, soccer, golf and ran track at Manasquan High School in New Jersey. But all he wanted to do in college was play golf. “That’s when I realized I have to really dedicate myself to this if I want to play,” Sabins said. That dedication came in the form of Brookdale Community College, where Sabins spent a year and a half taking general education classes while transforming his golf game. A typical day started with morning classes, an intentional schedule choice Sabins made to leave room for golf in the afternoons. From lunch until dinner, Sabins was on the course or hitting range balls. It was nothing exciting, just a big open field with a few targets so Sabins could practice nearly every shot he could think of. Out in the field, he could keep chipping away at the chip on his shoulder. Out in the field, he was just a kid who had been ignored by nearly every Division I golf program. After graduating early, Sabins packed his golf equipment and headed to North Carolina in the spring of 2017 to live with family members. For three months, Sabins did nothing but work on his game in preparation for what was hopefully to come in the next year. He had always been good at chipping and putting around the greens — good enough to earn Sabins All-State honors in high school. The next step was getting better with his iron and driver. Round two of emails came around. Once again, Sabins emailed almost every Division I golf coach. He received six responses. Four were courtesy good luck wishes along the lines of, “We appreciate your interest in our program and we wish you luck in the future, but no thanks.” Two emails showed potential. One was from Monmouth University, a school 15 minutes from his house. The other came from Butler golf coach Bill Mattingly. Mattingly said he likes to respond to as many golfers that reach out to him as possible, even if it is just a quick response. Having a son walk on to the golf team at Loyola in 2001, he understood where Sabins was coming from. “Logan replied back to me and that showed some sincerity to what he was trying to do,” Mattingly said. Finally, two years of practice had come to fruition. But the work did not stop there. Sabins spent all summer under the impression that he would have to fight for a spot as a walk-on during tryouts. More range balls, more practice, more tournaments. In early August, Sabins heard the words he had been working toward since graduating high school: a guaranteed spot on Butler’s golf team. A combination of summer tournament finishes, a top 10 at the New Jersey State Open, and golf pros who vouched for Sabin landed him a spot on the team. For all that led up to Sabins getting a spot on Butler’s team, his first hole of fall tryouts was anticlimactic. The tryout was supposed to help identify each golfer’s potential. Sabins’ tee shot landed in the pond of Prestwick Country Club. He took a penalty stroke then hit his third shot within 40 feet of the hole before making the putt for par. In the fall, Sabins recorded two top 10’s in four events and finishing in the top 25 in the other two. Sabins said his short game was good throughout the fall and practicing with his teammates every day helped him strengthen the rest of his game. “I think playing with my teammates at practice every day and seeing how they are all very good ball strikers was really helpful,” Sabins said. By February, Sabins had won an event in his first year of college golf, putting up a 7-under score in the Invitational at Savannah-Harbor. 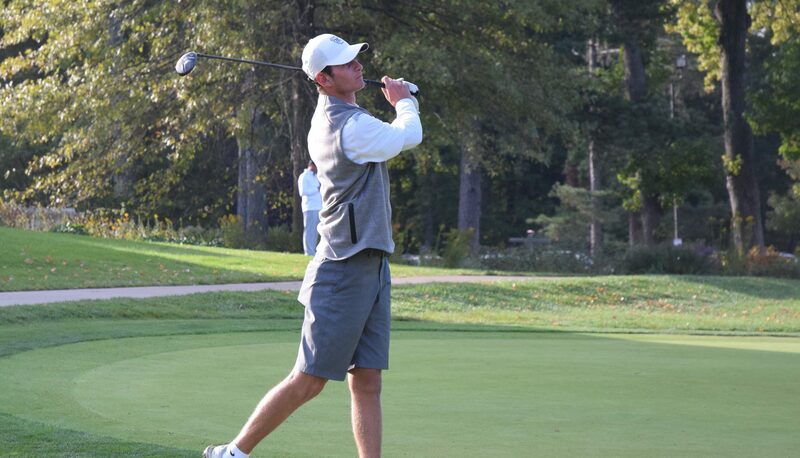 Enduring tough conditions, Sabins’ score was 16 shots better than the next Butler golfer. He was under par all three rounds and won the event by two shots. He made a college golf team, he made it into Butler’s starting lineup, and he won an invitational. What is Sabins going to do now? The same thing he did in New Jersey and North Carolina. He’s headed to the driving range, because there are still golf balls to be hit and work to be done.